At a rough guess, blobs in a video game are probably closer to beats in a Choose Your Own Adventure-style book than anything else – the beats are all there, but can be approached in a variety of orders. It’s a similar level of author and player controlled pace, with CYOA leaning more toward authors and video games leaning more toward players. But the key idea is that there are various keystone blobs that can be approached by a variety of vectors – for example, whether the player sneaks past the guard, bullshits the guard or kills the guard, what happens in the office being guarded is relatively intact. * Talk to the mother, and realize that she’s forgotten her son. * Meet the son, who tells you that he doesn’t want his mother to remember him. Taken in the current order, the story is pretty clear – you talk to the mother, and the game points you toward finding the son. But if you go the opposite direction (meeting the son first), you’re pointed toward finding out who the mother is that the son is so afraid of. In one direction, the reason for the mother’s loss of memory is the impetus and the son’s reluctance to be found is the answer, but in the reverse the son’s reluctance is the impetus, and the reason for the mother’s loss of memory is the answer. I’ve done similar things when structuring LARPs – there are a few key scenes that need to happen during the night, but when they happen and how they happen develop organically through the game, rather than on a particular railroad. Granted, the author/audience control is far different in a LARP (the most immediate difference being that a LARP’s ending comes from the players, but most video game stories have an author-crafted ending of some sort). However, the main idea is that one group might go in ABCD with blobs, while another goes ACBD and a third goes ADBC, and they all get a story that’s essentially similar but a little unique, as the order provides slightly different textures to the overall experience. I think this is where video games can actually improve the storytelling experience over non-interactive media – giving players a similar enough story that they can still say they’ve played the same game, while offering a different textural experience that is unique (or relatively unique) to each player. If crafted right, blobs being all over the place can be a feature of interactive storytelling, rather than a bug. Let me give some more concrete examples. This is a snip from one of the Exalted SASs I developed. If you look at each box as a blob or beat, it has a pretty straight-forward lead up until the middle. Those four blobs can be approached in any order, but a number of them are touched before you come out the other end and back on the railroad. That box is what I was thinking of when I mentioned ACBD order, but you can take lots of boxes like that and stack them together into a story structure. Here’s a more complex example from another SAS (Blood Drive, from Hunter: The Vigil). The story idea is taking a vampire from Philadelphia to Chicago. 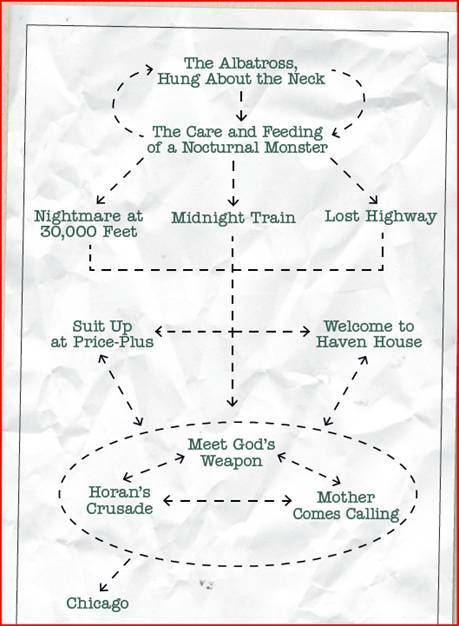 As you can see, there are four rough “boxes”: Getting the vampire (the circular bit at the top), transporting the vampire (the three routes under it), stops along the way (the branch with “Suit Up at Price-Plus” and “Welcome to Haven House”), and the big showdown (the circle at the bottom which can happen in any order). It all leads to an ending in Chicago. There’s a lot of options in this story (perhaps a few more than would make sense in a video game), but it’s still more or less a progression from top to bottom. If you take a rising action chart and stick it along the side, it still follows that structure. Even if you open it up, though, there’s still a need for some structure. Here’s one final snip from another Hunter SAS, Bad Night at Blackmoon Farm. This is more like a dungeon crawl or exploring a large map than anything else, but there’s still a lead-in, and one location triggers the end sequence of blobs. Some players can jump right to the chase, while others will explore and get a deeper sense of the backstory for the area, but the story is still there. 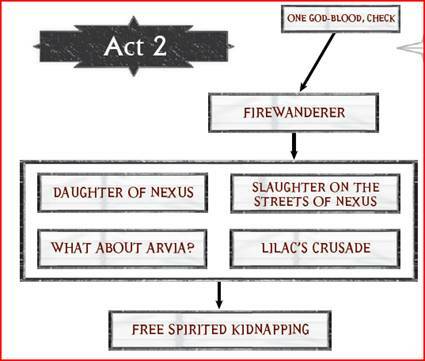 None of these even look at multiple endings (because, being a tabletop structure, the “end scene” is actual open for players and Storytellers to interpret), but it’s generally what I was thinking of when I talked about non-linear structure. I think you can provide flexibility and meaningful choices in narratives while still providing enough structure to give a cohesive story experience. This is very interesting. I've always wondered if interactive storytelling should rely on the story being inherent in the game, or if the story should simply appear via interaction with the world. For example, the new Adventure Path over at Paizo creates a whole section of the world that you and your group are thrust into with a goal in mind – there are points of interest, but the whole thing is up to the players. I've done this in LARP as well (with mixed success). 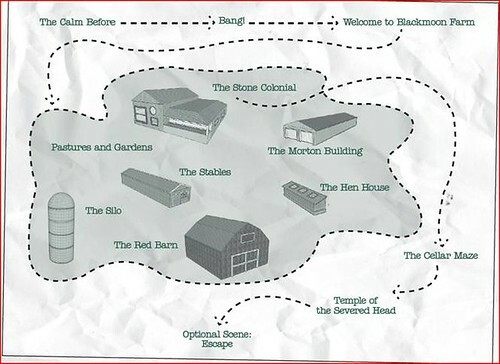 I guess the question is: do blobs of story or blobs of interactive area do better when trying to tell an emergent story? My original post was slanted toward video games, with the slant of a fair amount of author agency . Most tabletop games have a roughly equal balance between player and Storyteller agency, and LARPs are heavily slanted toward player agency. As such, while there are bits you can use for any interactive storytelling attempt, keep in mind that the various media have different challenges involved. That being said, giving more agency to the players isn't necessarily the answer. Obviously, take too much away and it stops being interactive, but give too much and you have to hope that a narrative emerges. ("The Sims" is a perfect example of near-total player agency — stories will often result from playing The Sims, but they're often player-generated and player-detailed. In other words, the players create the structure, not the authors of the game, a power balance that's closer to an RPG designer and a play group than a traditional video game team and its customers.) Again, giving the players the chance to create their own stories is powerful, but the idea of this is to balance author and player agency in a way that is recognizable as the same "story" between individuals. I talk about story in one of my ICC presentations (I forget which one — check the "Free Stuff" page to reference them). There, I mention something that was the germ of this opinion — that "story" comes after interactions. You play the game, and then afterwards you piece it together into a story. More work at the onset makes it easier to draw a logical narrative, but even totally random games can have some kind of narrative once it's experiences. LARPs are unique because dozens or hundreds of people are involved in the same suite of interactions (not the exact same interactions, but a limited set of them) and get a variety of similar-but-unique stories from it. The further removes the players are from the main action, the more their story differs from the rest of the group, and it's even possible for regularly marginalized players to end up playing a subtly different game entirely over time. Coming around to your question (finally! ), yes I believe blobs are best designed when they are linked together into an implied story to start. Players will naturally follow the narrative intent of the blobs, but with enough flex between them, they will find unique stories of their own. I think the Grand Theft Auto games do this really well — there's a clear story over the course of the various missions, but how you get from mission to mission, and sometimes how you complete each mission, is up to each individual player. Footnote 1: In case it isn't clear, "agency" in this case means "narrative authority," or who drives the pace and progress of the story.